I have a habit of looking at any container that could fit on the back of my kayak and figuring out if it would make a good bait tank. 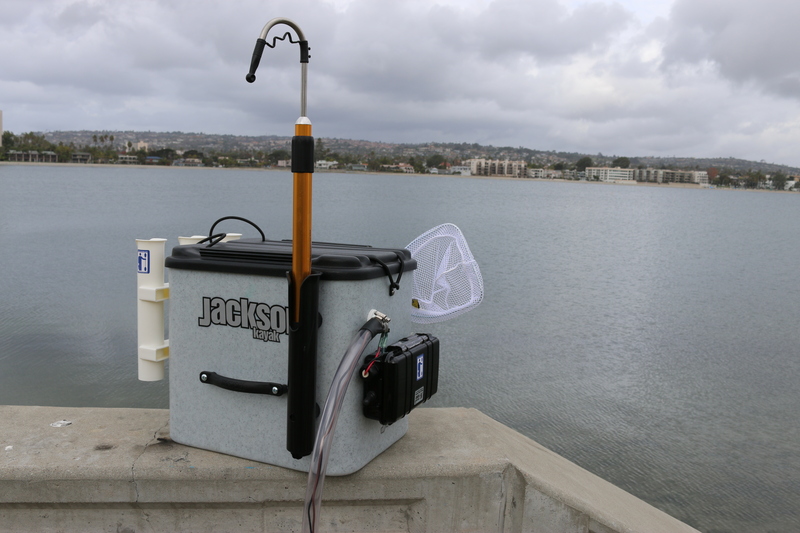 Well Jackson Kayak made an awesome container called the JKrate to fit on the back of their kayaks and the guys at OEX Kayaks in San Diego helped me turn it into an awesome bait tank. 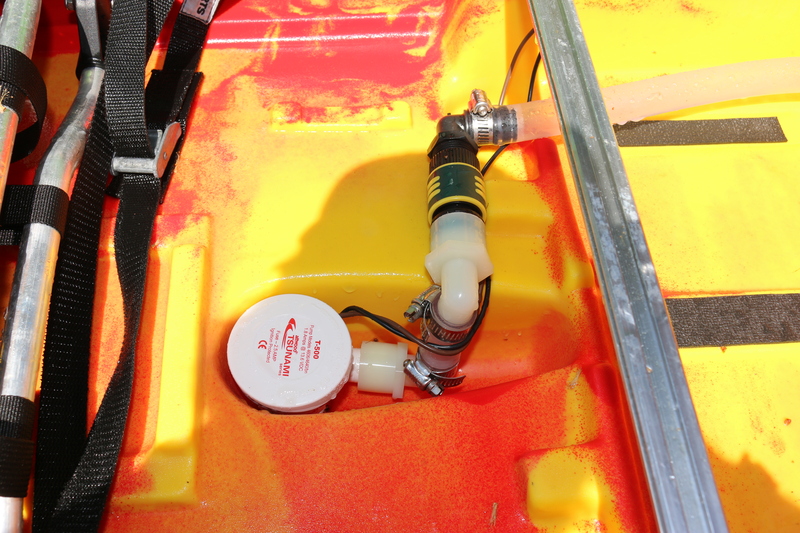 The first step is placing the Jkrate in the back of the intended kayak and figure out the orientation that you will need to use. 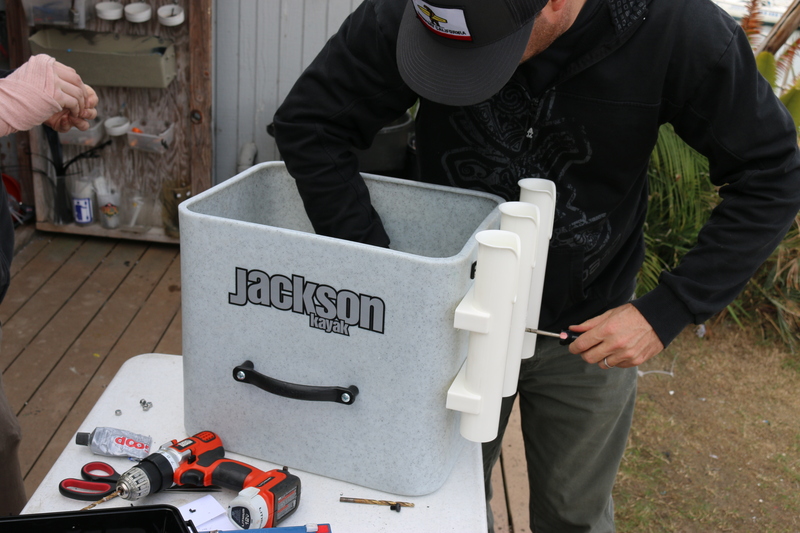 Once that if figured you may need to remove the side handles and relocate to the other sides, this is easy as the JKrate has inserts in the plastic to screw into. 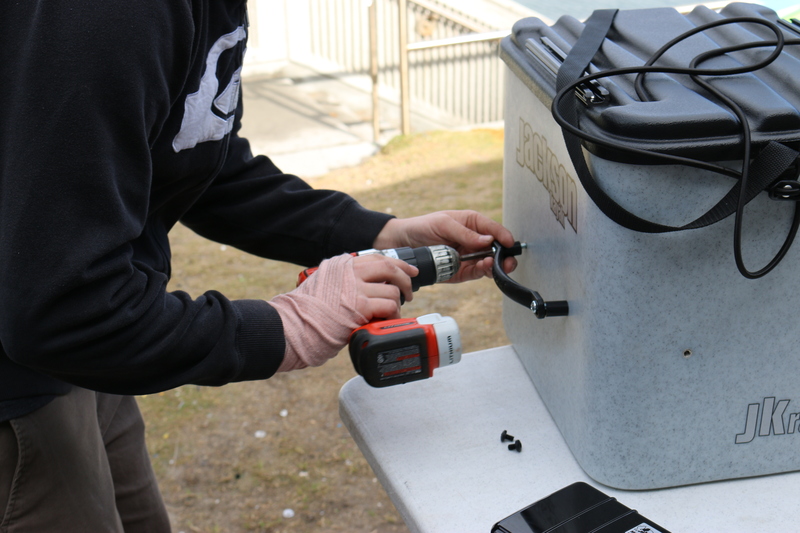 The next step for me was to rearrange the bungee that secures the lid, when new there is a lot of excess bungee that allows the lid to come a long way off, I wanted to keep the lid tighter. 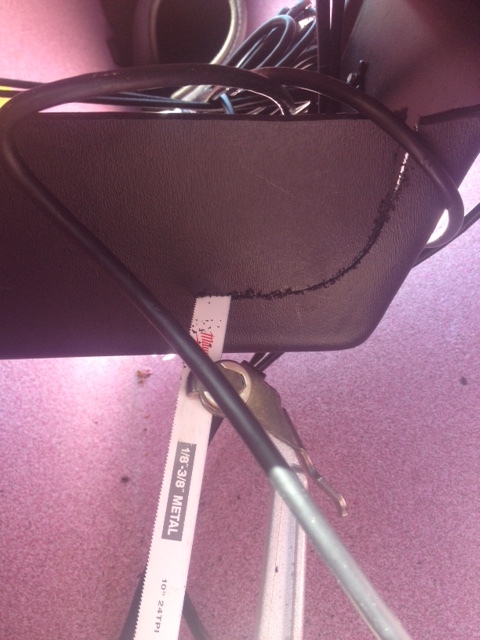 So a couple loops on one end and another on the other side to hold it down and it was done. 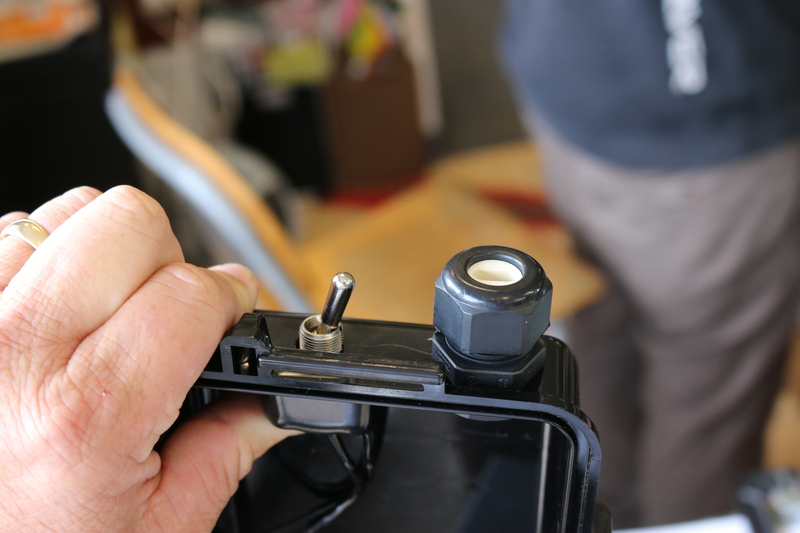 The next step was to add the three position rod holder to the back, I like them so the top of the rod holder is just above the lid, you also need to make sure that the holes don’t hit the inserts in the tank. 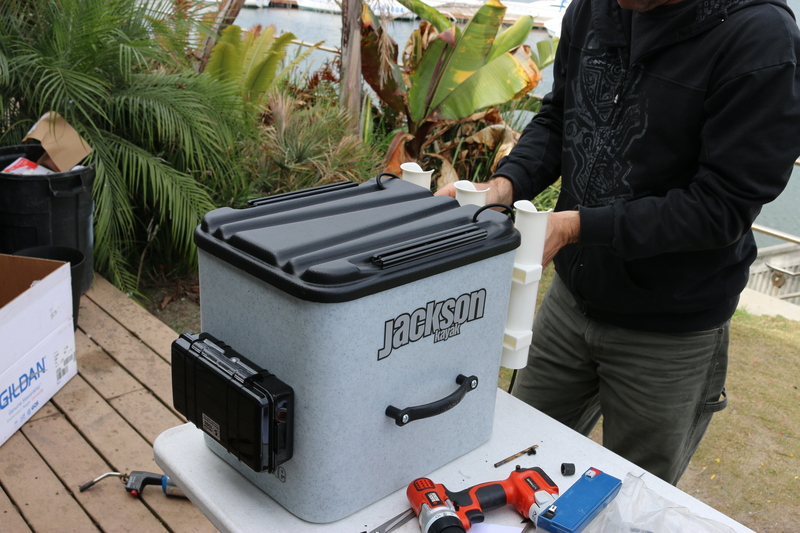 Next we attached the small Pelican case which will hold the 6v 12amp battery and the power switch. 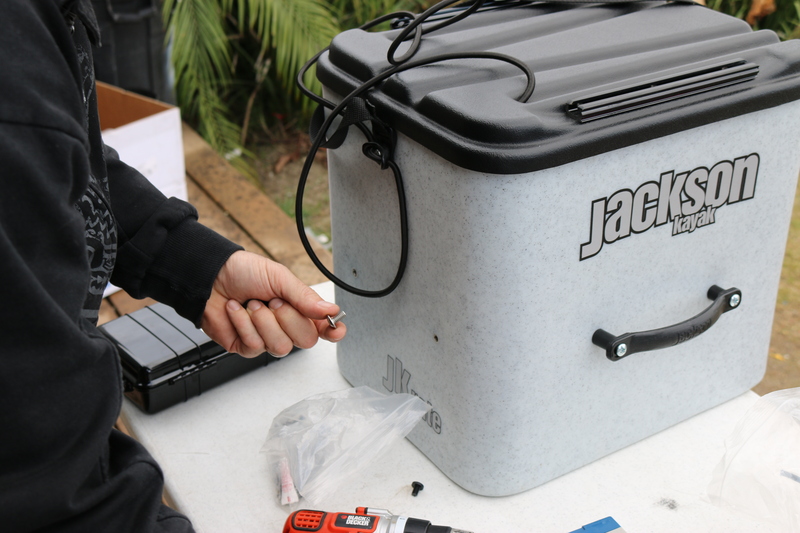 Before attaching to the JKrate you will need to drill it out for the waterproof switch, and waterproof wire connector. 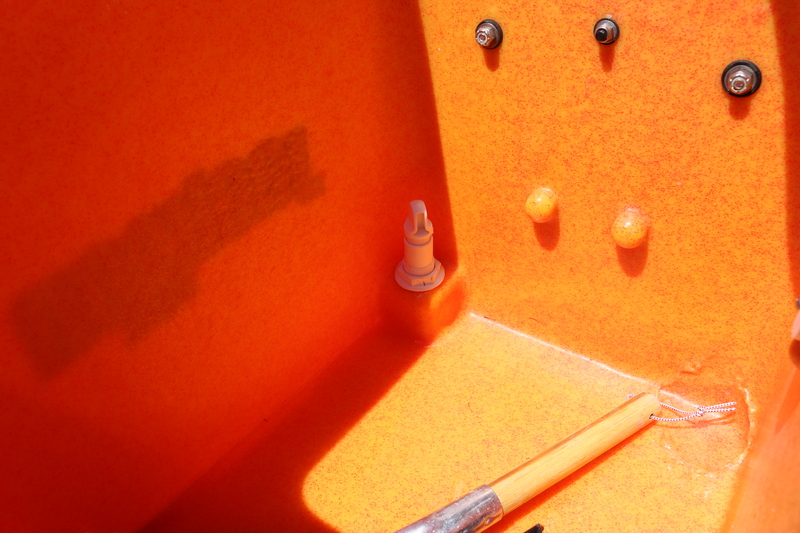 You will also drill two holes to match the inserts in the tank as that is what you will you to attach the case to the tank. 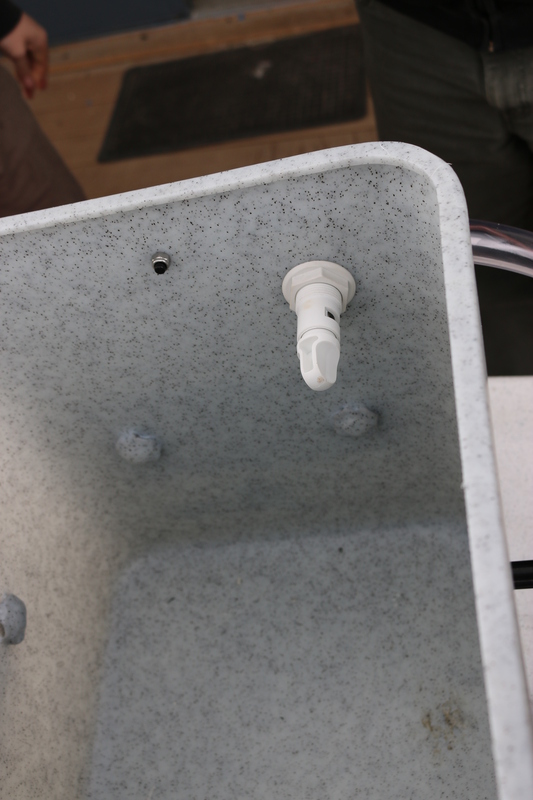 You will need to drill three larger holes in the tank next, one for the adjustable spray head, one for the upper overflow and one for the drain. 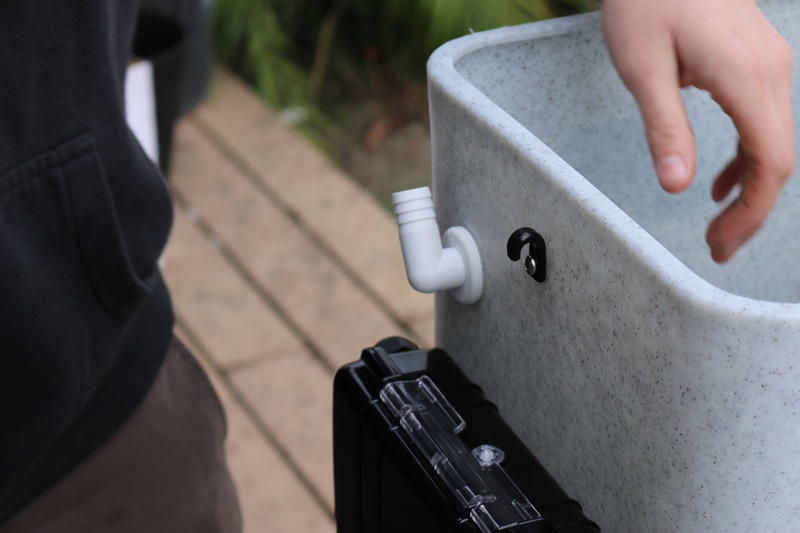 The height of the overflow will determine the amount of water you carry so you can put it as high or low as you wish, depending how much weight you want to carry or the size of your bait. 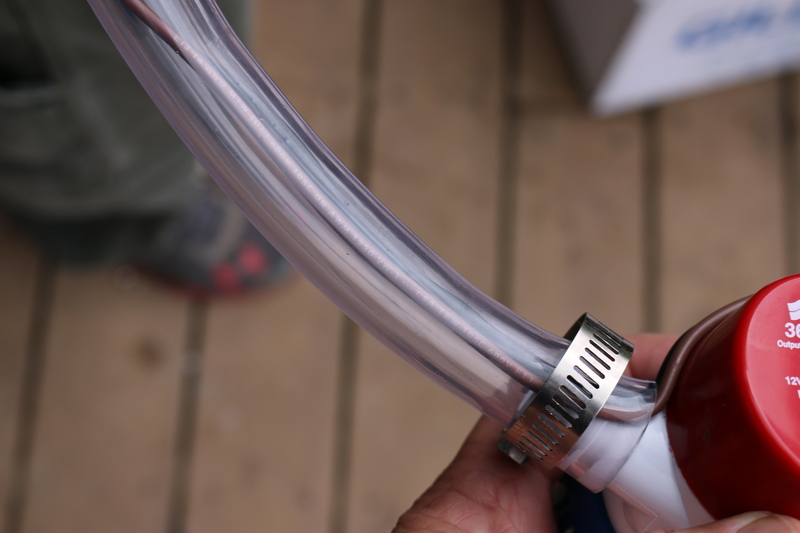 overflow mounted on side with added hose. 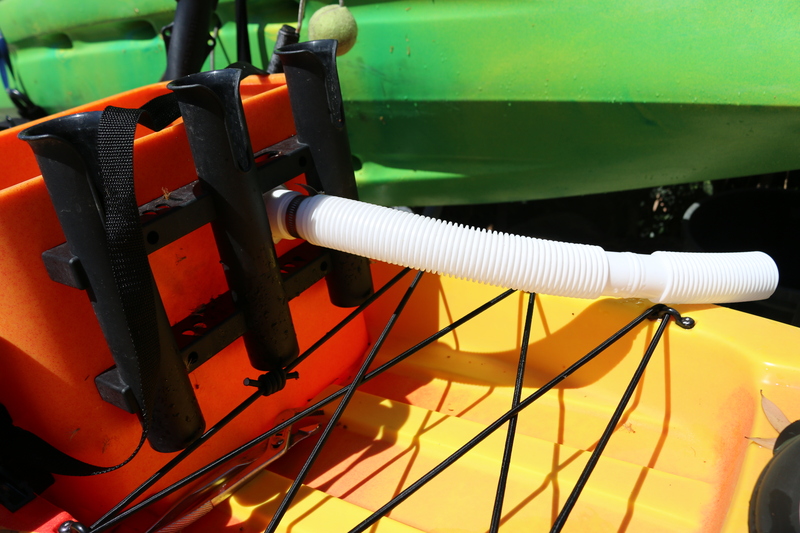 Now we attach the hose and bilge pump, I like to run the wires for the pump up inside the hose this has a much cleaner look and avoids the use of zip ties. 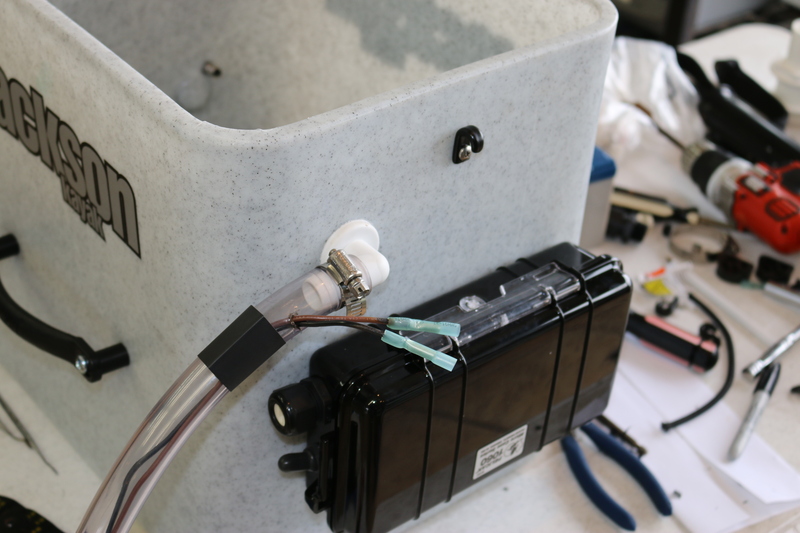 Run your wires from the switch through the water tight connector and hook it up and you are almost done. I decided to add a couple more single rod holders to the sides of the tank, one for holding my gaff and one for holding a bait net. 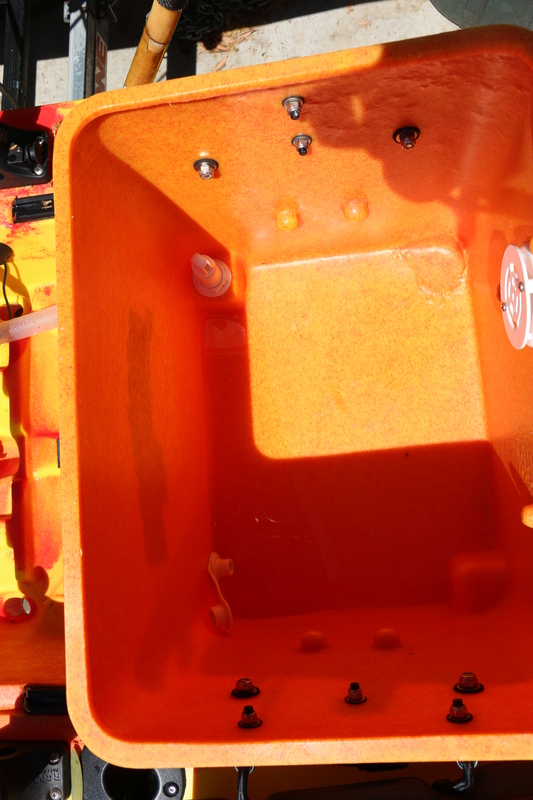 Marine Goop was used on all connections and holes to keep things as water tight as possible. The build took about an hour to complete. 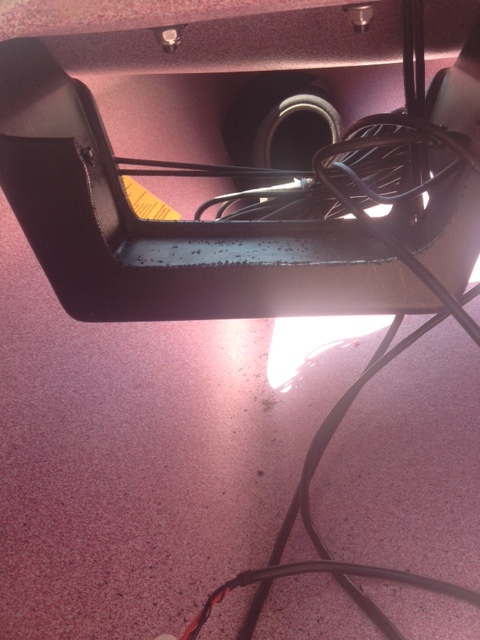 And here you have a few shots of the finished product. I can’t thank the guys at OEX Kayaks and Kayak Fishing Supplies enough for their help with this project. 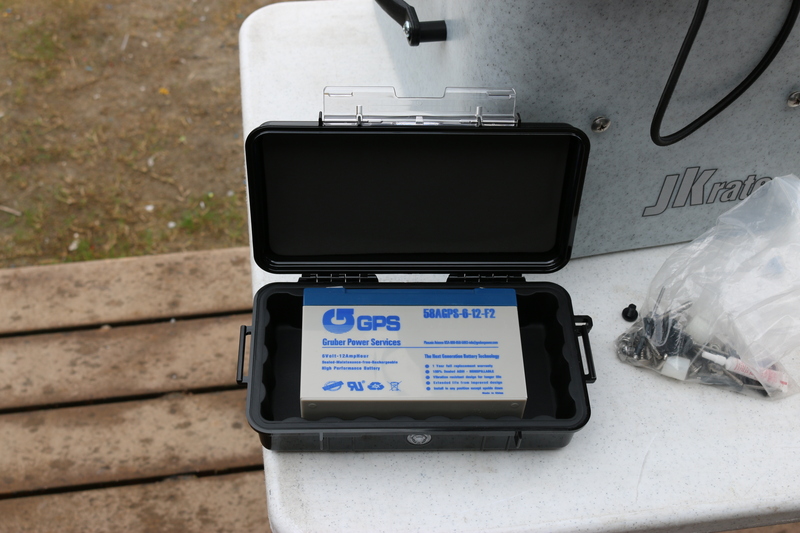 Here is a list of the parts we used for the bait tank prodject, all of which are available at Kayak Fishing Supplies. Having worked in the kayak fishing industry for over 20 years I have heard just about every question people can think of about the sport. Whether it is at a trade show, during a trip, or on the internet people come up with many of the same questions. I thought this would be a good place to answers some of the more common questions I hear. 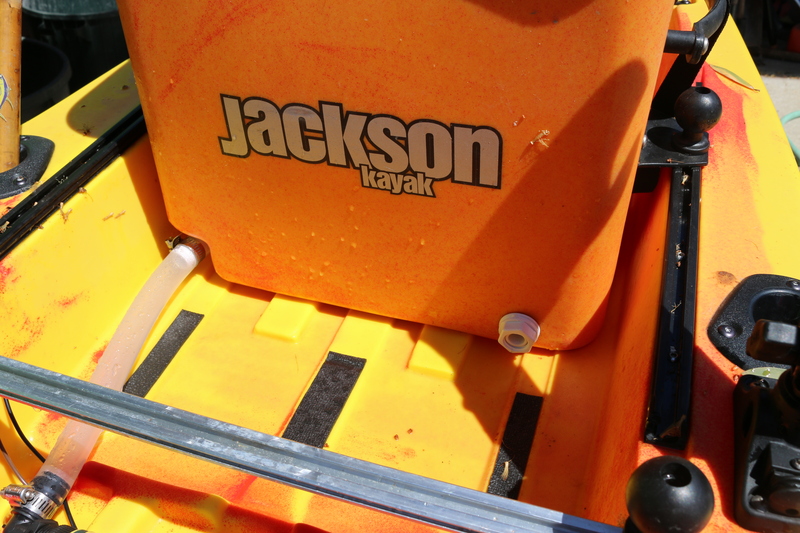 I could tell you the Jackson Kayak Cuda 14 that I am currently using is the perfect kayak. In reality, there is no perfect kayak for everyone. Think of it like shoes, there is no one shoe that fits every person, and there is no one kayak that every person is comfortable in. The best thing you can do is to ask some questions from people already involved in the sport; you can do this on one of the kayak fishing web sites. 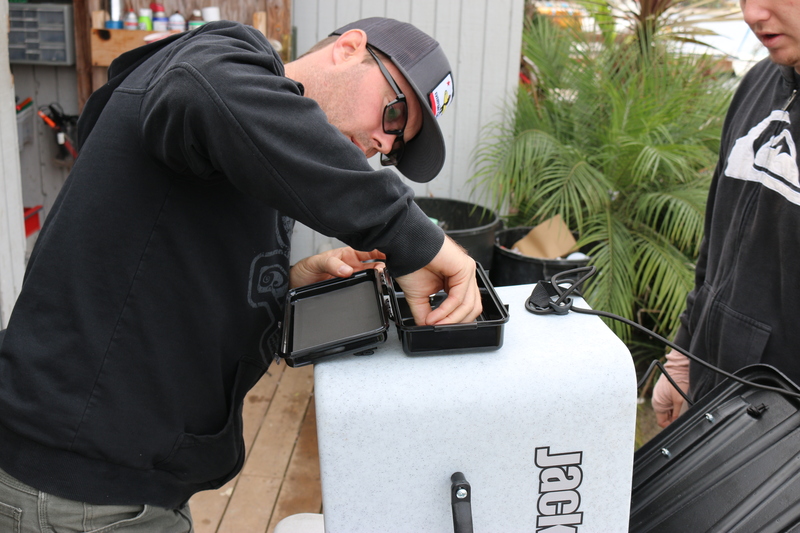 Give them your height, weight, what you plan on fishing for, what kind of water you plan on paddling, plus any other pertinent info such as storage limitations. 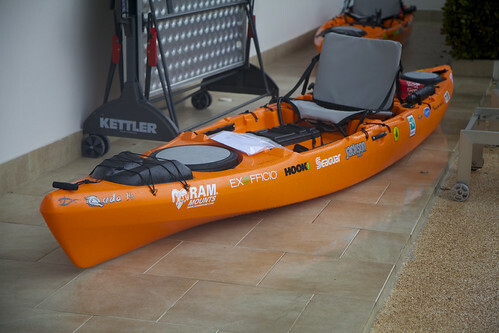 You likely will be given several kayaks, from different manufacturers, from which to choose. 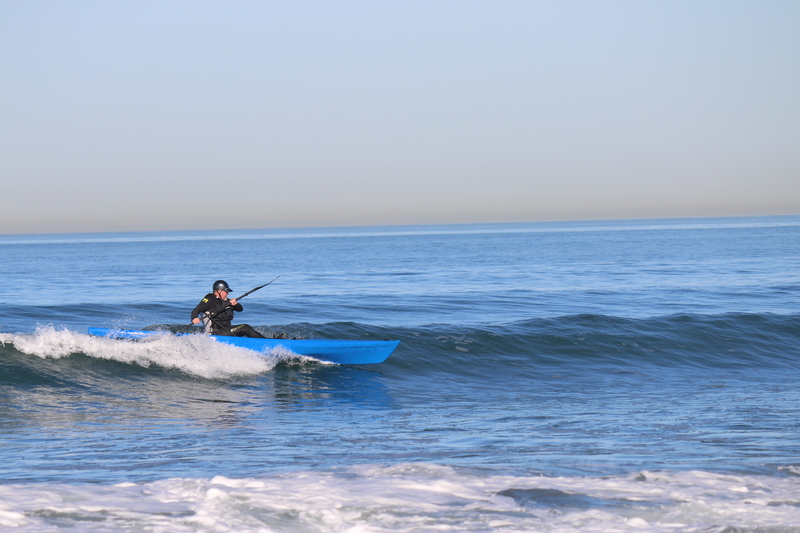 Find the shops in your area that stock these kayaks to demo, and take them for a test paddle. 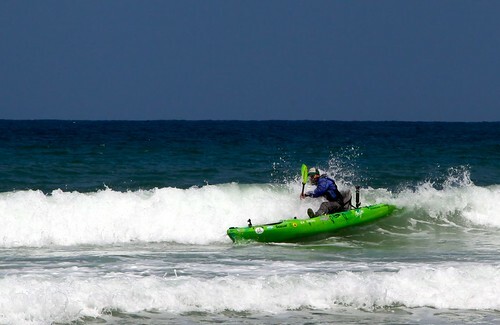 If you can take the kayak out on a day when the water is a bit choppy you will get a better idea of its performance. 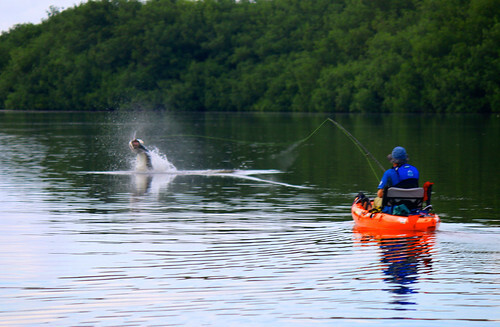 You will then be able to make an educated decision on which is the correct kayak for you. Don’t over estimate the importance of stability, sure you don’t want to feel like you are in a fight to stay upright all day but you also don’t want to feel you are trying to paddle the dock out to sea. The learning curve for feeling stable in a kayak is rather short, you will learn to be stable but you cannot make a slow boat fast. The short answer is this; yes, even the kayaks that are considered tippy, are stable, if you take the time to learn the how to be a good paddler. 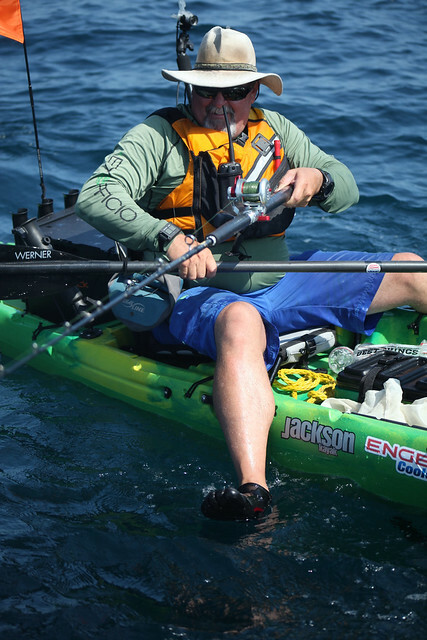 If you are looking for ultra-stability for stand up fishing, kayaks with that feature are also available, take a look at the new Jackson Kayak BIG RIG, you can stand up and dance on that baby. 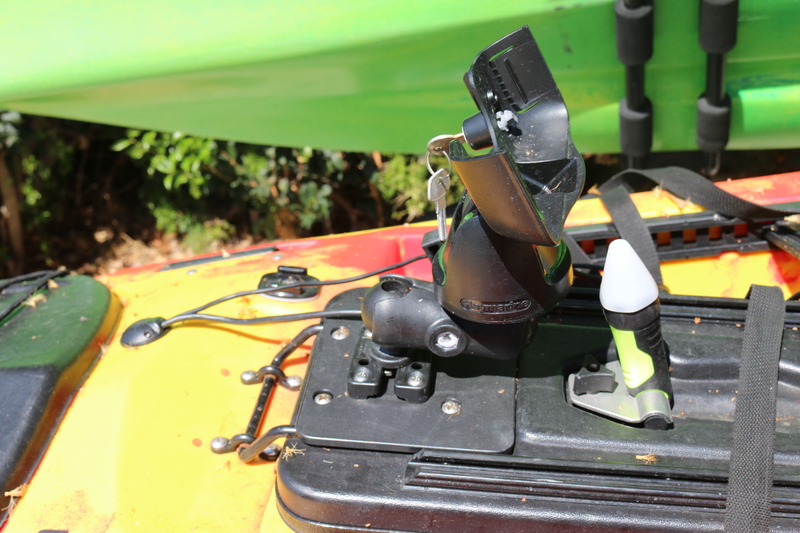 If you want to go the fast kayak route but still want stability to stand from time to time you can even add stabilizers that can be added or removed whenever needed. 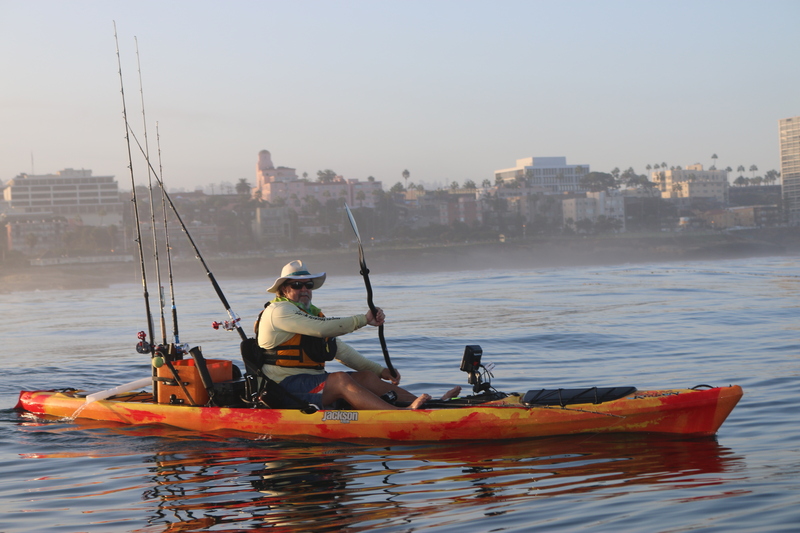 The average kayak fisherman is actually a fairly large person and the kayak manufactures have addressed this with a variety of kayaks that will fit persons of all sizes, see the Big Rig mentioned above if you doubt me. The longer the kayak the better it glides through the water, so the less effort I have to put out to move the kayak through the water. Think of it this way, have you ever pedaled a bike with low air in the tires, then gone to the gas station and filled those tires up? That is what it feels like to go from a short kayak to a long one. You can still get there on the bike with low tires, but it is a lot easier once those tires are pumped up. So for the longer distance paddling I tend to do I prefer a longer kayak, now when hitting smaller lakes or running some rapids a shorter kayak like the Jackson Coosa is a better choice. I see there are a couple pedal kayaks out there why do you still paddle? The answer to this would be multifold the first part being that I just really enjoy and prefer paddling. While pedaling employs your legs, paddling, when done properly involves your entire body. I also like the simplicity of paddling, having no mechanism to maintain or that could potentially break while on the water. I also like to fish in and around the thick kelp beds which my paddle kayak will glide right over and when fishing in amongst the rocks on the inside or while gliding down rivers I don’t have to worry about hitting a rock and breaking anything. I also do a lot of launching through the surf and the paddle boats just seem to do that better. Many of the pedal boats are much heavier, which with my bad back is a major issue, and cost a lot more, which with my empty wallet is also an issue. I will say this, paddling does take a certain amount of skill that the pedal boats don’t require. No this is not rocket science but a little technique goes a long way and taking a paddling class will really help you improve your skills and add to your enjoyment on the water. To be clear, there is nothing wrong with the pedal boats and they make fine products but for what I like to do and my style I prefer to paddle. You will find paddles ranging in price from $49 to $500, with the carbon fibers starting around $200. Your paddle is your motor and I generally tell people to get the best motor they can afford. Would you rather have a Porsche motor or a Volkswagen motor? 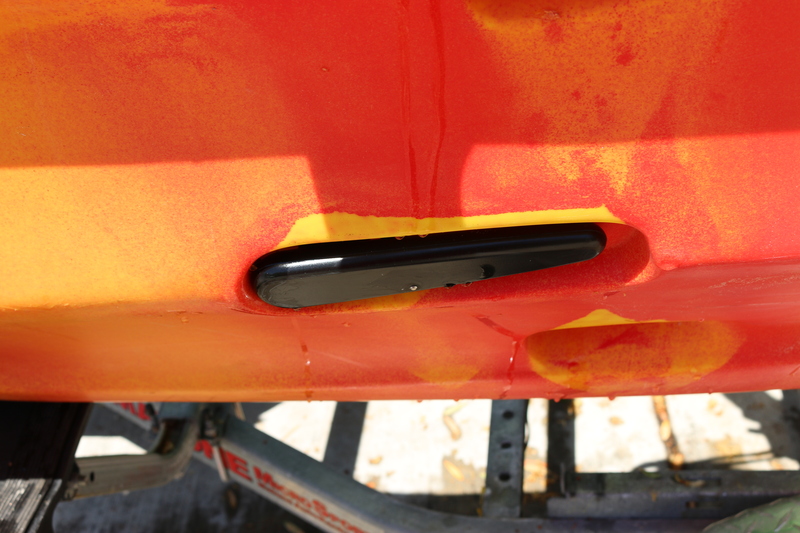 Carbon fiber paddles are lighter and stronger than lower cost paddles, so like the faster kayak, with the lighter paddle I will have to work less to move my boat through the water, all, day, long. 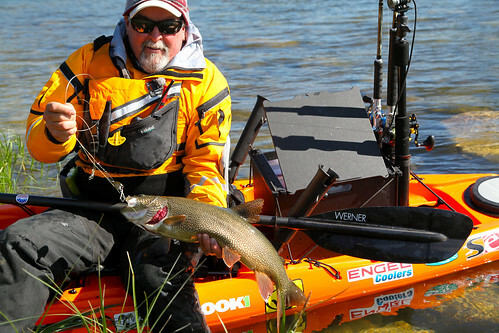 I have been using a Werner Kaliste paddle for a few years now and there is nothing like it. Watch this video of one of my clients in Baja for a great example of what it is like to go for a sleigh ride in a Cuda 14!! People generally fall off the kayaks because they forget one basic rule, where your head goes your body will follow. 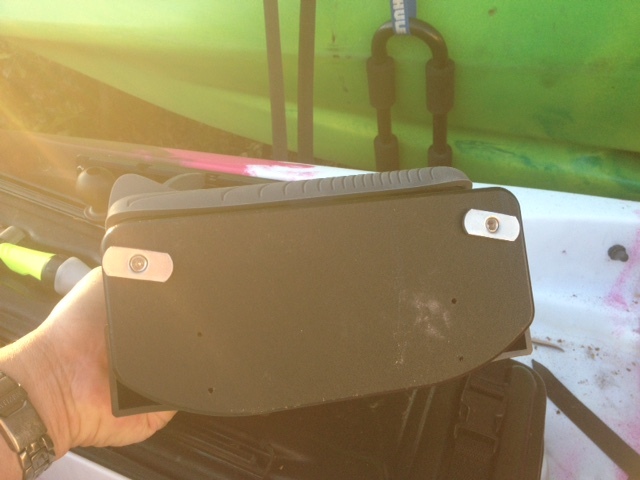 You should always keep your head down the centerline of the kayak, letting the kayak move under you. You should also know how to do a self-rescue, and practice it. The last thing you want to happen is to fall off your kayak a mile from the beach and realize you do not know how to get back on. Here is an article on doing a self rescue, read it then go practice. We practice a lot of catch and release but I do like to keep fish for the dinner table. 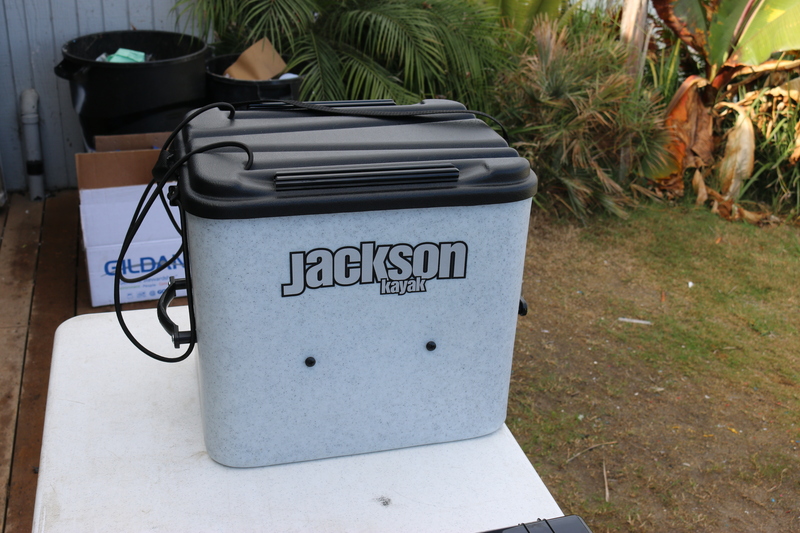 When I am keeping fish, I want to keep them as fresh as possible, so I have an insulated game bag that fits into the center hatch of my Cuda 14. I can keep my fish inside the kayak on ice. The other options would be a divers game clip or a gunnysack. I do not recommend hanging the fish off the side of the kayak, as this is just an invitation to unwanted guests. Aren’t you afraid of sharks? I have a healthy respect for sharks but I would not say I have a fear of them. I have had instances where sharks have taken fish while on my line as well as out of my hand as you can see in this video. 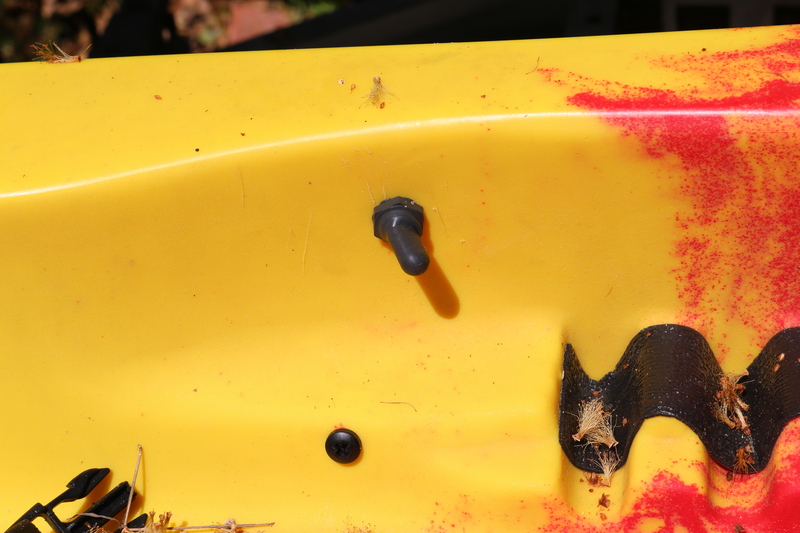 If you are in a sharky area you certainly do not want to have fish hanging off the side of your kayak and I would think twice about bleeding my catch. 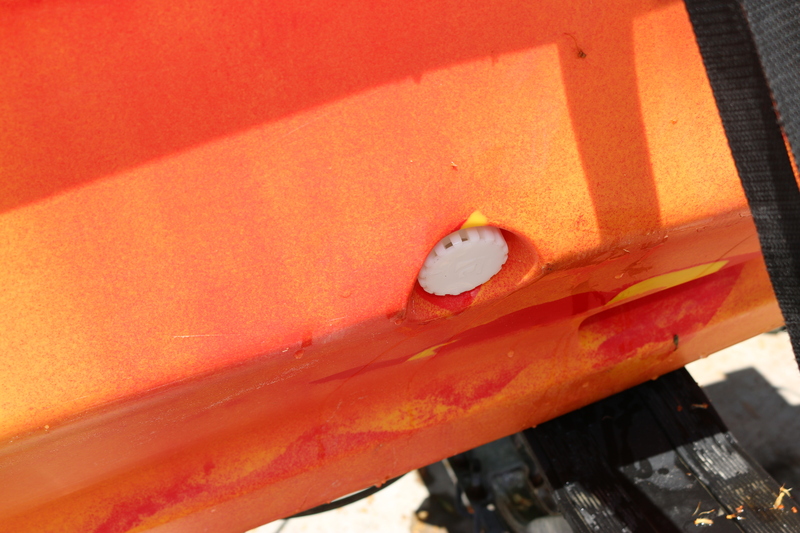 It is also a good idea to keep your feet aboard your kayak in sharky areas. 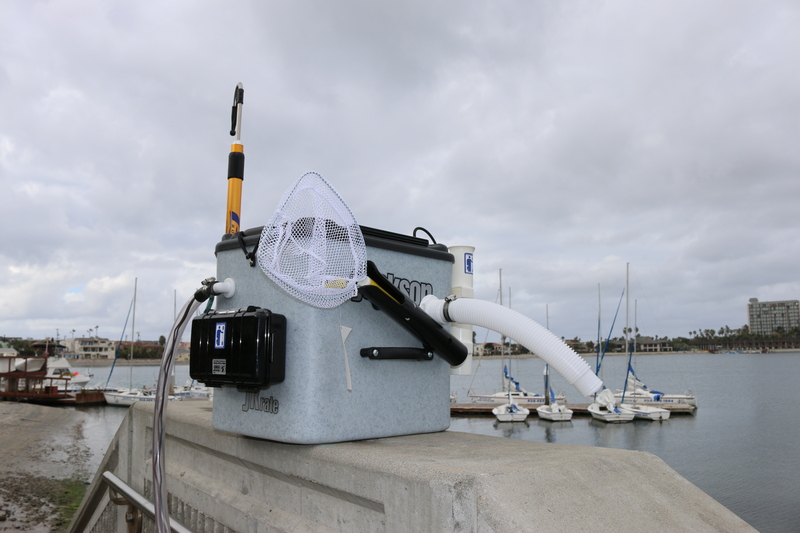 If you tend to fish in areas what have a lot of shark activity an investment in a Shark Shield, an electronic shark deterrent, is a good idea. I have used this product and can tell you first hand that it works. 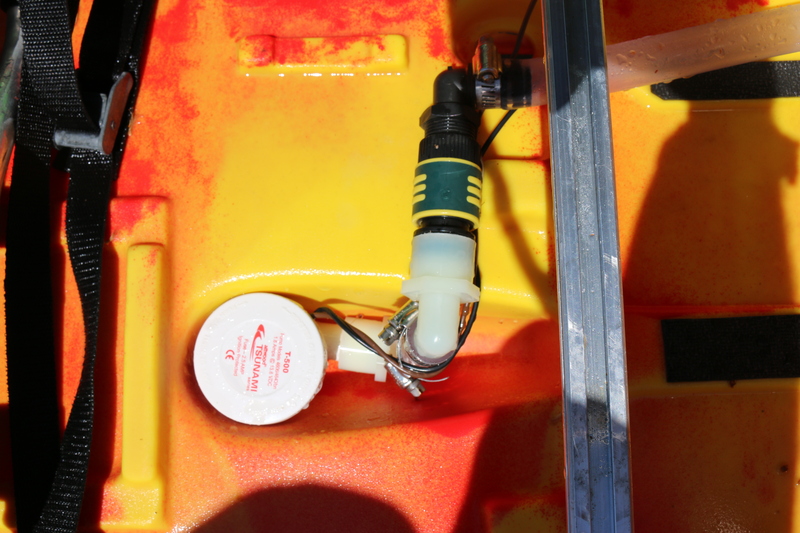 Check out this video of the Shark Shield in Action. 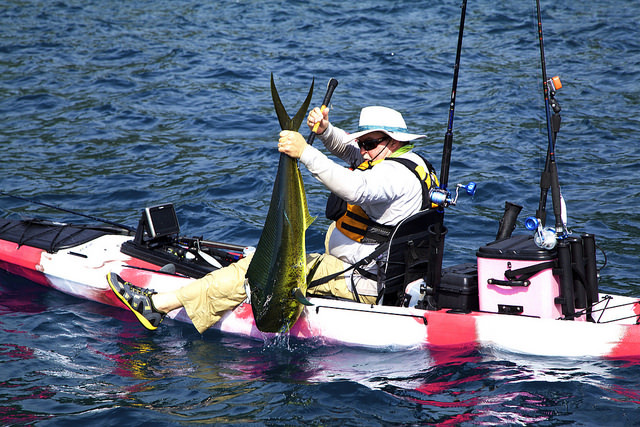 People fly fish out of float tubes all the time; a kayak is an even better platform. 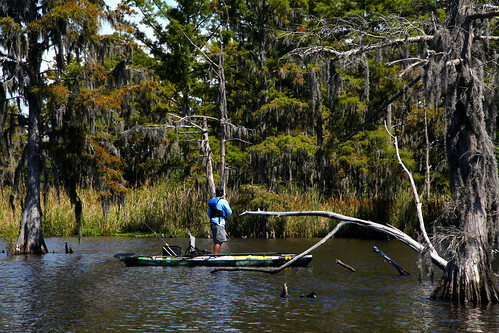 Fly-fishing off the kayaks has become a large part of the sport. 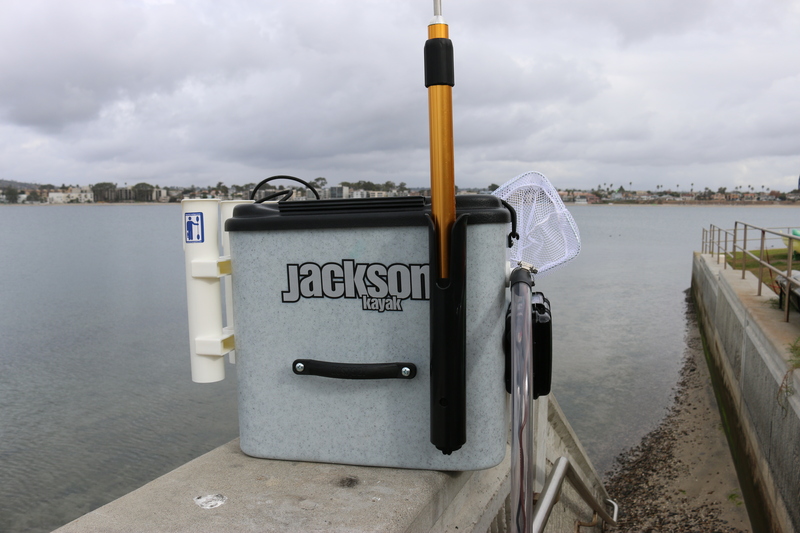 With the stand-up ability you have on the Jackson Cuda and Big Rig fly fishing is a natural. 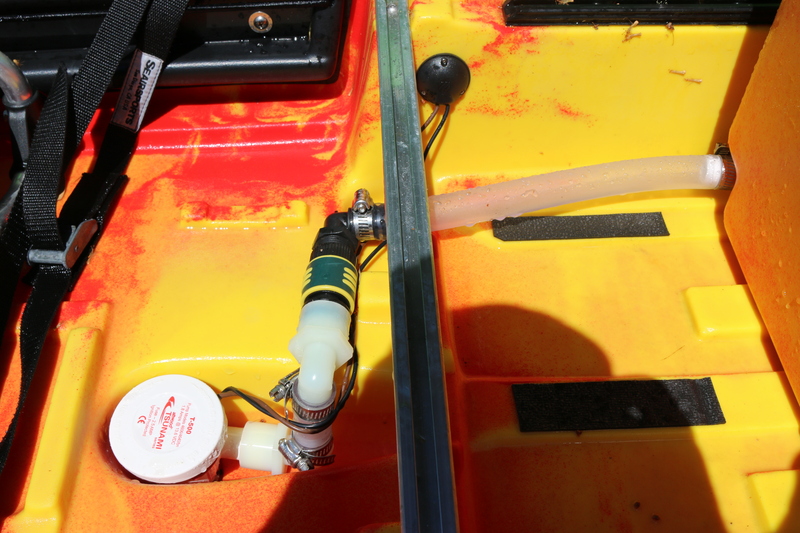 There is room for everything including the kitchen sink on most of the fishing kayak on the market, so I am sure you will find room for your beverage of choice. Do remember this, in a kayak you do have to paddle back from where ever you are, and alcohol is a depressant and can make you tired and a bit lazy. 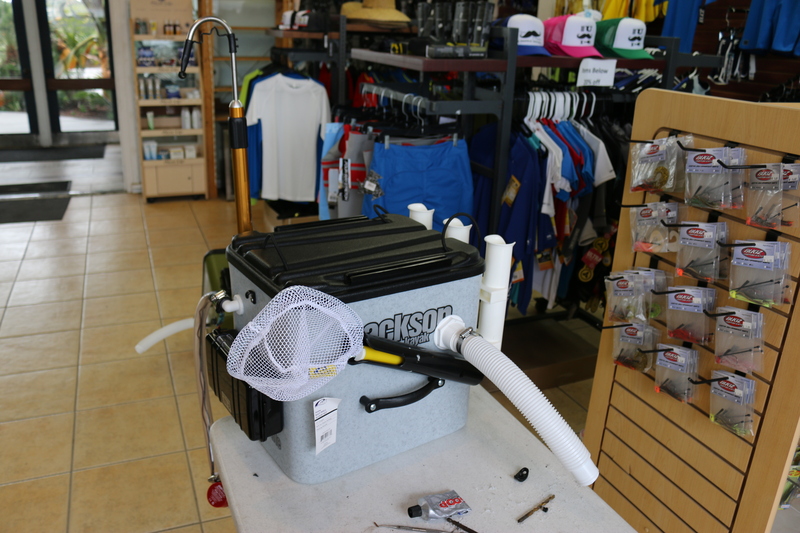 I prefer to have my cold ones as I am cleaning my gear at home. You may also want to check the regulations for your area, I know some places don’t allow drinking on the water. In the past I would have answered this question with yes but that was before the insanely comfortable seats on the Jackson kayaks came out. If you can sit in a lounge chair next to the pool, you can sit in one of these kayaks. On a sit on top kayak you can move all over the deck and even sit sideways when you need a change of position, which really lessons the strain on the back. Start with short days on the water and build up to the all day excursions, so that your muscles have a chance to get in shape for this activity. Lets just say, yes you can, and let you figure it out from there. If you are talking about two adults, get singles you will be much happier. If you will be taking your child out with you, the tandem is a great way to get them on the water. If your spouse says, “if you get a kayak you have to get one that I can go on with you”, think long and hard about the percentage of time your spouse will actually go. If you will be paddling the tandem as a single more than 50% of the time, I suggest getting a good single and renting the tandem for those times when your spouse goes out with you. Of course, you could always get both. 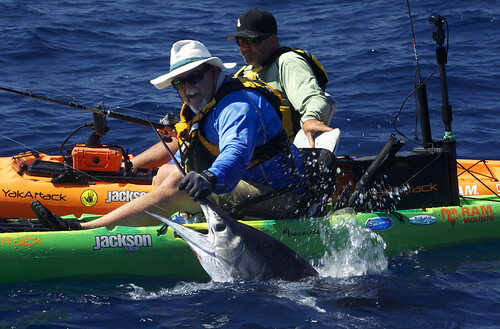 Another option is a tandem like the Jackson Big Tuna. 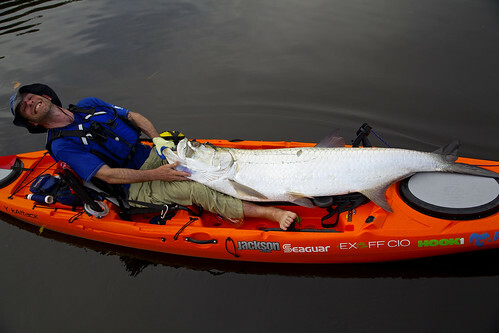 This kayak is big enough for two but easily switches to a single. Just like any boat fisherman I want to have a rod ready for any type of fishing I may do that day, so I carry five to six rod with me on my kayak. The kayaks on the market today have plenty of storage so it is not really an issue. 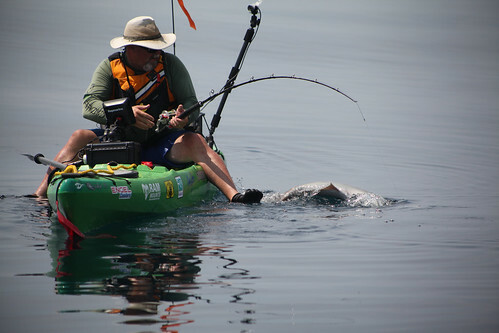 I have a live bait system on my kayak and will always have bait soaking in the water, even when I am tossing jigs. 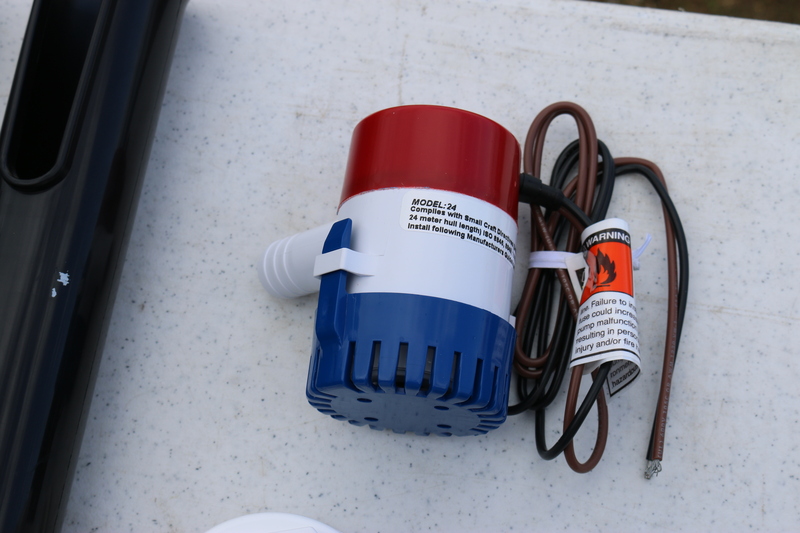 You can keep bait in anything from a Plano bait sled, a bait tube or if you want to hold a larger quantity of bait, a live bait tank. 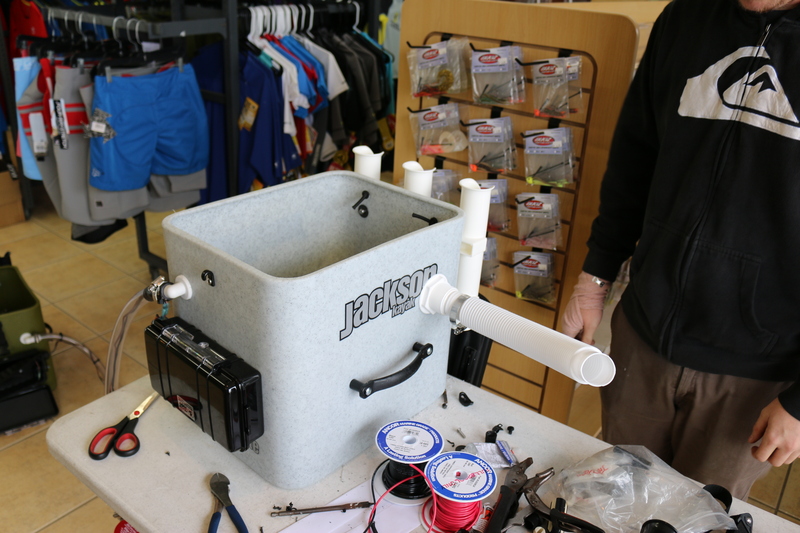 You can purchase a custom bait tank for your kayak or make your own. 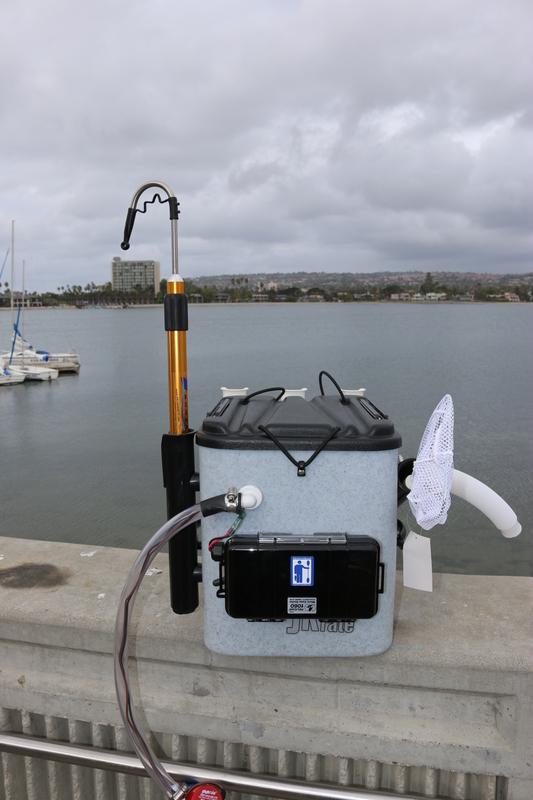 My friends at OEX have turned the JKrate into a great custom bait tank. I am not a big fan of wetsuits; they are a bit confining and can get too cold if it is windy and too hot when the sun is out. I prefer actual paddling clothing such as dry pants and paddle jackets. These will keep you dry, warm, keep the wind out and are easy to peel off when it gets warm. Lightweight breathable waders are my go to clothing when it gets chilly and for the coldest environments a dry suit may be the best option. Kokatat makes some of the best paddling clothing available see what they have to offer for your style of fishing and conditions. 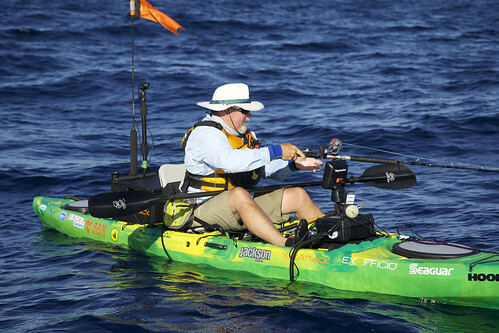 I have found the biggest problem with kayak fishermen is that they are fisherman first and kayakers a distant second. They never seem to want to learn to be a good paddler, which is a mistake because it would make them a better kayak fisherman. In my opinion you should at least take a class to learn to paddle correctly, how to self and assisted rescue and how to navigate the surf zone. 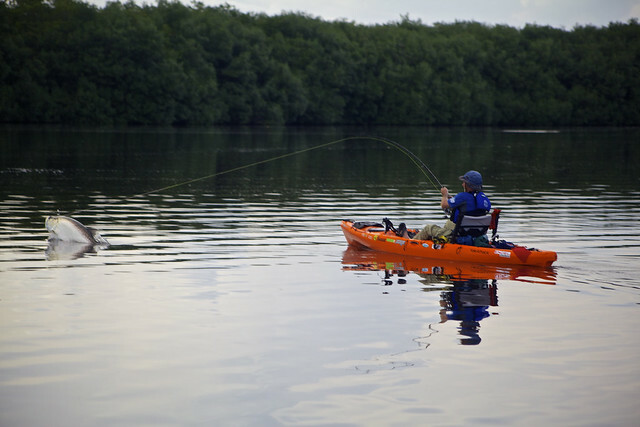 An all day class with a guide will also help decrease the learning curve when it comes to kayak rigging and fishing techniques specific to kayaks and your area. 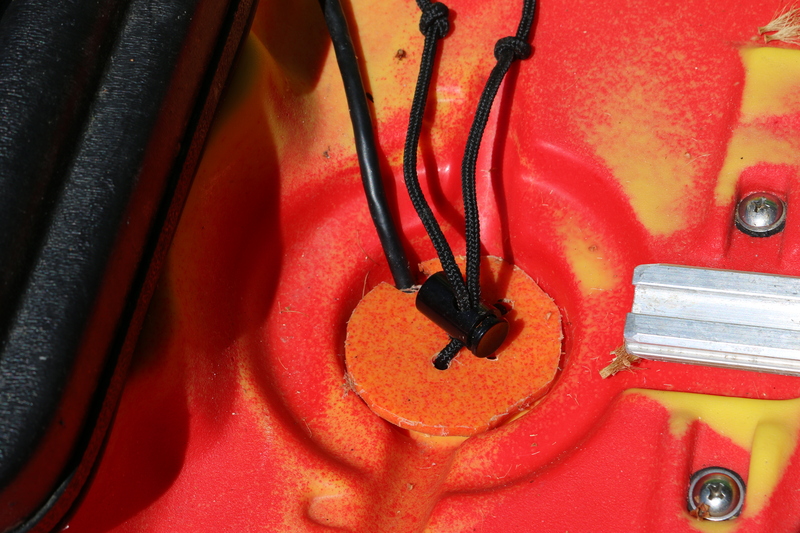 In California, you only need to register your kayak if you put a motor on it. You will need to check by state what the requirements are. 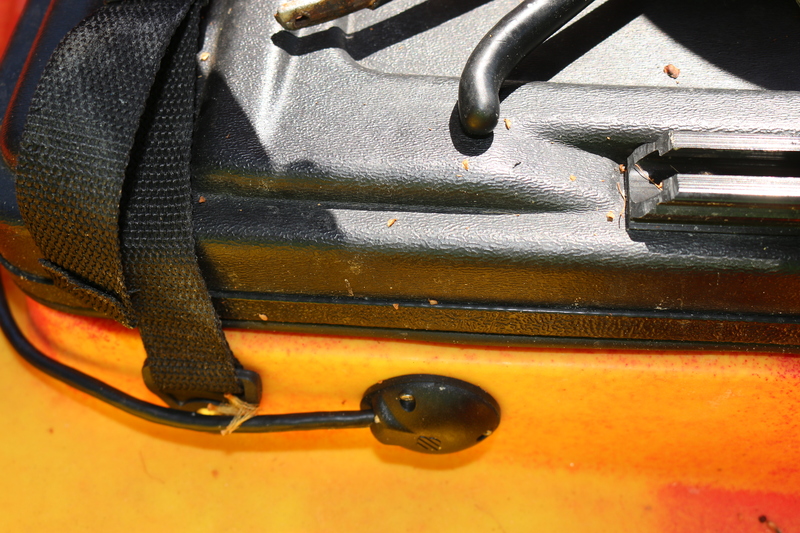 Legally you must carry a Personal Floatation Device (PFD) on your kayak, children are required to wear it. 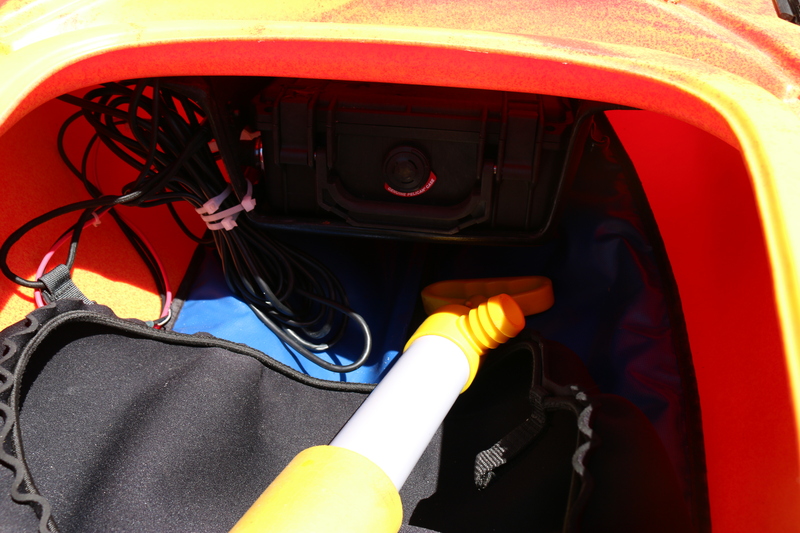 A PFD will do you no good when you need it if it is tucked down inside your hull. Get a PFD designed for paddling and wear it at all times for your own safety. The best quote I have heard on this came from a coast guard officer I was chatting with. “We never find dead bodies wearing PFD’s”! 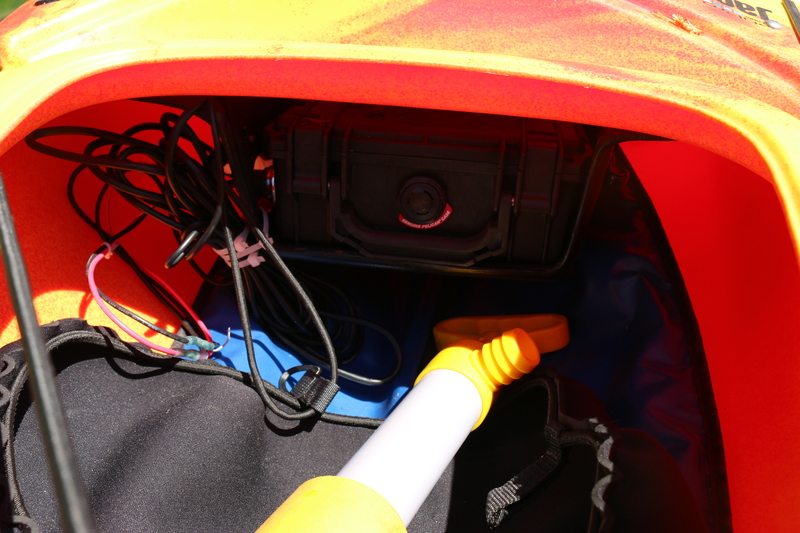 Most of the people that kayak fish a lot have a full spread of electronics on their kayaks, including fish finders, GPS and VHF radios. 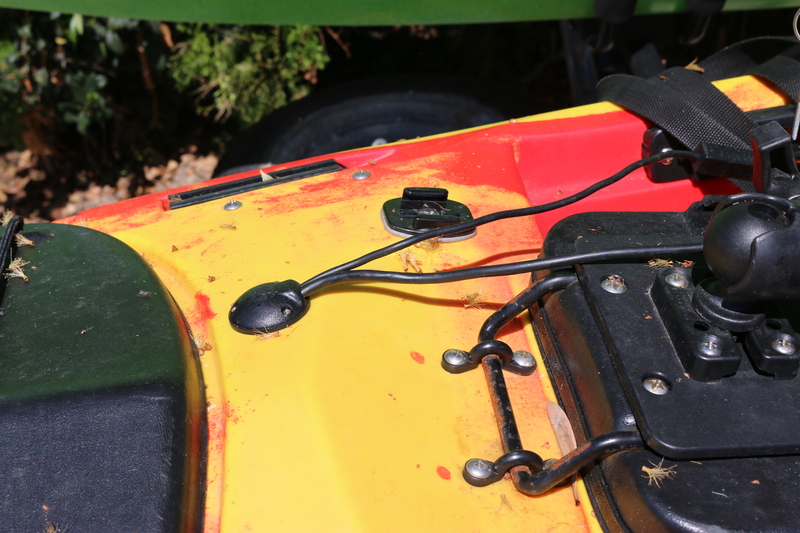 You can even put a waterproof stereo on your kayak if that is your thing. 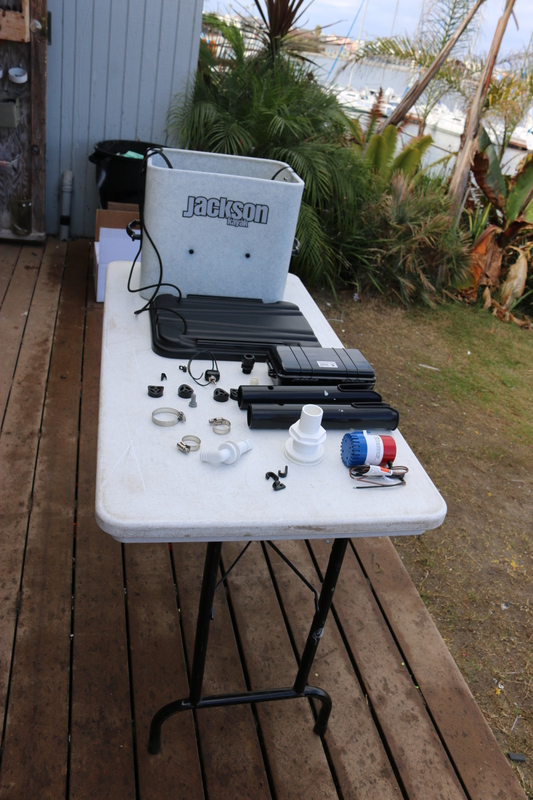 Be aware though that salt water and electronics do not get along and special care is needed if you want this equipment to last. 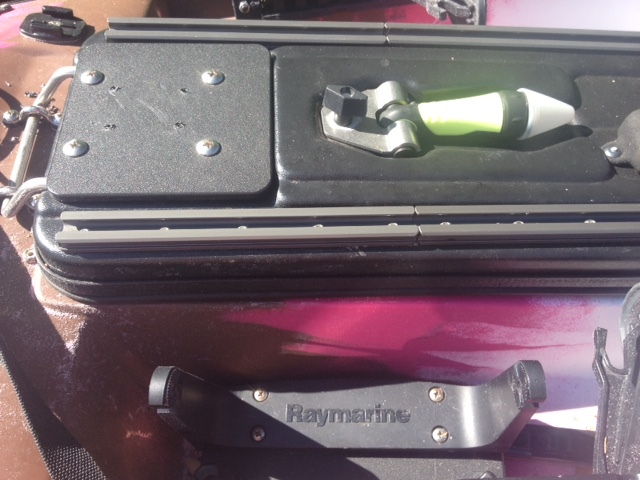 Take a look at the Raymarine Dragonfly fish finder this thing is perfect for the kayak. 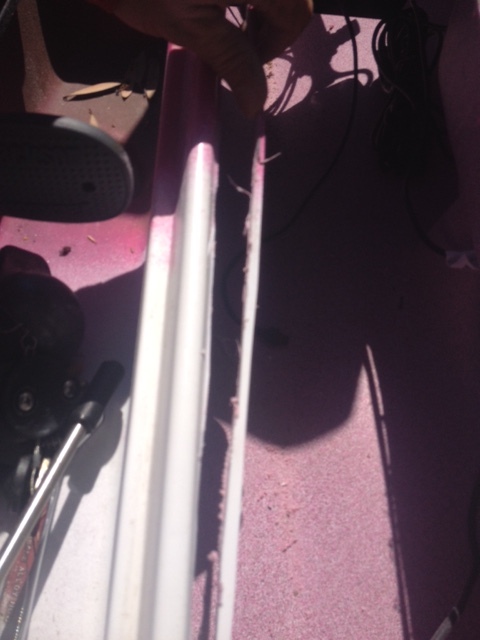 There is no right or wrong way to rig your kayak; some people want their rods in front some in back. 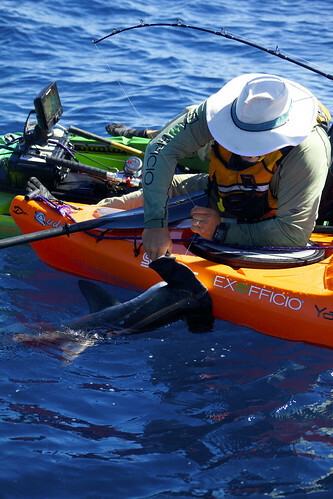 Take your time setting up your kayak so you get it done right the first time. 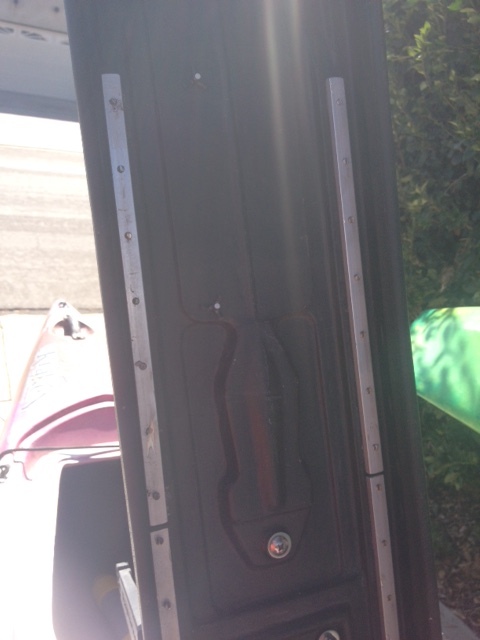 My kayak has ten rod holders on it, so I can place rods in different places for different situations. 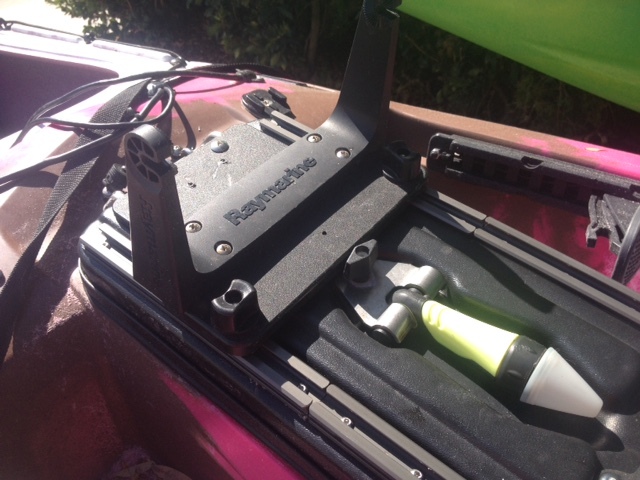 Take a look at some of the great options on rigging your kayak from Yakattack and Ram mounts over at Hook1 kayak fishing gear. This is really a personal choice, if you want to be seen you should get the brightest colored kayaks such as yellow, orange, or lime green. I on the other hand prefer the duller colors like grey, olive green and blue-grey. This is just a sampling of the questions that I hear about this sport on a regular basis, I am sure you can come up with some more. Of course, these answers are only my personal opinions, and I am sure if you asked someone else, you would get different answers. If you come up with more questions please feel free to post them on our Kayak Fishing Show Facebook Page or send them directly to me at Jim@Kayak4Fish.com I am always happy to help.